Workman Publishing Company, 9780761168935, 204pp. Over 40? Getting forgetful? Having trouble learning new things, or remembering that actress’s name without reaching for your smartphone? Neurobics are simple, unique brain exercises that can be done anywhere, anytime. 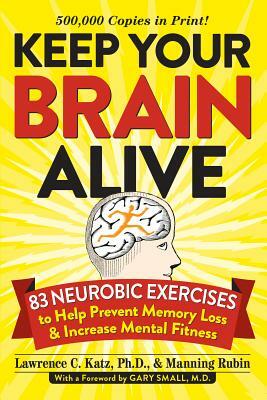 Now, the Neurobics bestseller How to Keep Your Brain Alive is repackaged in a trim, tote-able format that makes it an ideal gift. Based on leading neurobiological research, Keep Your Brain Alive introduces a regimen of mental cross-training—a series of deceptively simple exercises that help stimulate the production of natural growth factors called neurotrophins, which in turn grow brain cells and keep the brain younger and stronger. And nothing so easily stimulates the brain as breaking routines and using the five senses in new and unexpected ways. So if you’re right-handed, wake up tomorrow and brush your teeth with your left hand. Or close your eyes before you get in the car and insert the key into the ignition. Every time you open a new circuit in your brain, it’s like doing a round of mental sit-ups. Dr. Lawrence Katz was a professor of neurobiology and researcher at Duke University Medical Center. He lived in Durham, North Carolina. Manning Rubin, a former Creative Director at J. Walter Thompson and Senior Creative Supervisor at K2Digital, Inc. is now at work on several new books. He lives in Pawlet, VT.
Gary Small, M.D., is director of the UCLA Longevity Center. Named one of the world’s leading innovators in science and technology by Scientific American, he appears frequently on Today, Good Morning America, PBS, and CNN. He is also author of the bestselling The Memory Bible.